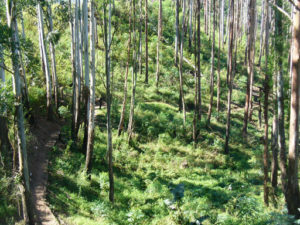 Contermanskloof in the northern suburbs of Cape Town is a privately owned and developed mountain bike trail. It forms part of what has slowly been developing into one of the best MTB trail systems in the Western Cape. The project has been spearheaded by the Tygerberg MTB club with a handful of dedicated souls with a vision of an integrated trail network for the Tygerberg Bellville area. The cooperation of some key land owners and the ability to link different areas together has led to the ongoing development to realise a dream of 120km of MTB trails. 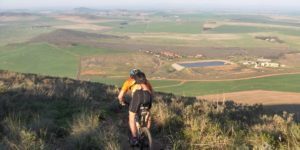 The Contermanskloof mountain bike trail now forms part of a growing network of trails including, Merendal, Hilcrest, Ntida and Majekforest sections. After spending a day riding in the Bains kloof area at the Gravel Travel MTB race we were looking for an easy recovery ride the following day. Well we didn’t find a recovery ride but we did find some seriously cool singletrack. I don’t think we could have chosen a better time to ride this trail, with the Cape winter coming to an end the landscape was a carpet of green with the wheat crops coming up strong. No wind and firm ground meant that the riding conditions were ideal. The trail head was about 2km off the Contermanskloof road at the Contermanskloof farm. The parking area is next to a small farm dam and there is a little hut where you pay your R30 trail fee and you can get some refreshments from the friendly country folk. The coolest thing about this trail is that it has the coolest bike shop in the world, The Bike Shed. This little bike shop literally is a shed with a bike shop inside and it is located on the farm. One minute we were climbing up some singletrack and then descending some singletrack and farm road between some trees and then all of a sudden The Bike Shed pops up out of nowhere! 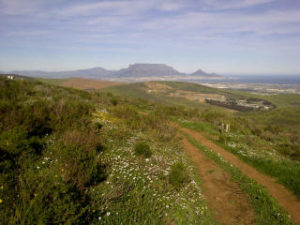 The trail has a mix of green, blue and black sections, you can find detailed description on the Tygerberg MTB website. We rode most of the blue and black sections and they provided some contoured singletrack climbing that presented some of the best views of Table Mountain and Table Bay that you can get from a mountain bike. The climb all the way to the top at the mast was really steep in the last section. However the reward was a rather technical black singletrack section with some tight hairpin bends. For the most part the trail flows very well and has been put together with a lot of thought. Twice we reached sections where you could transition into the Hilcrest trail if you wanted a longer ride. The last stretch home was on the Kliprug section referred to as the “Wild Side”. It was a particularly rocky and twisting singletrack section that required full attention to stay on the trail. All in all the ride was 21km long and took us around 2 hours with a total ascent of 580m. It was really fun riding with some awesome singletrack and amazing views. 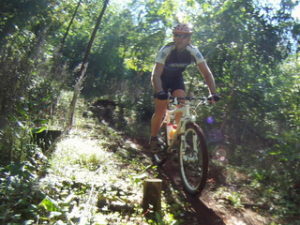 Highly recommended and we will definitely be back to sample some more of their fine singletrack.